Heirloom Audio Productions is the creator of our favorite audiotheater productions. You may remember our review from last year of Under Drake's Flag. 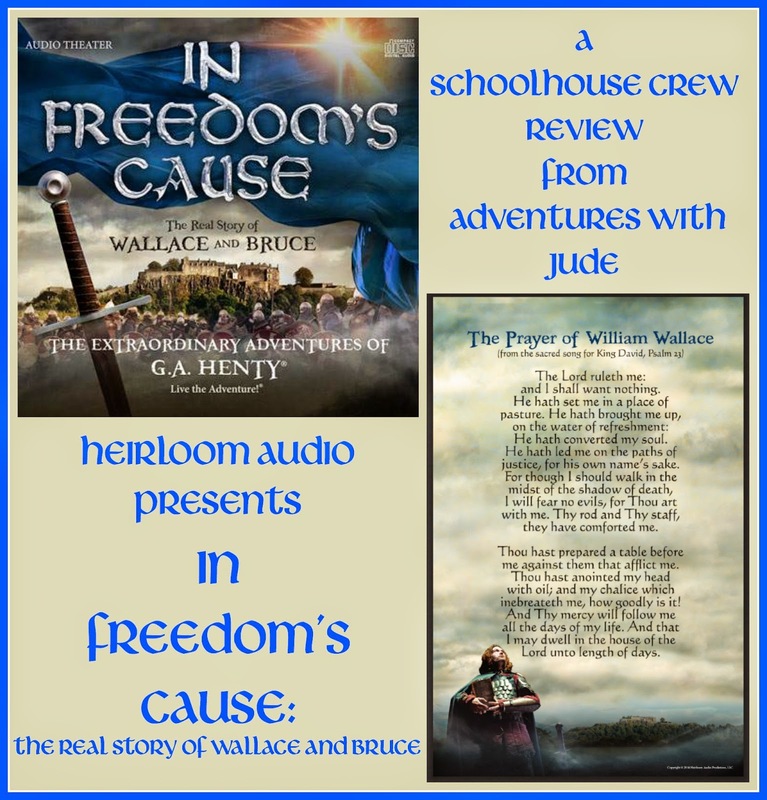 We absolutely fell in love with the productions, and when given the opportunity to review In Freedom's Cause: The Real Story of Wallace and Bruce (Single Package), we were incredibly excited. We were very excited when box arrived containing the 2-CD In Freedom's Cause set. Last year, we listened to the discs in the car driving to and from the hospital, so we set them aside for our weekly trip. Before we even got to listen to the CD, we were hooked on the music. It's simply gorgeous. Even without the spoken word with it, the music invites you into the story and hints at the intrigue to come. Luke was especially excited to listen to this story about William Wallace, the great Scotsman who wanted freedom for his country. While we were waiting for our CDs to arrive, he was participating in a course about the history of the United States government, and the lecturer wanted us to look at the American Revolution in context of the time period. He pointed out that many of our Founding Fathers come from a strong Scottish heritage, and subscribed to Wallace's "thatched roof castle" viewpoint. Not really knowing who William Wallace was, Luke was excited to study Wallace more in depth so he could better understand the early Americans' fierce desire for autonomy. G.A. 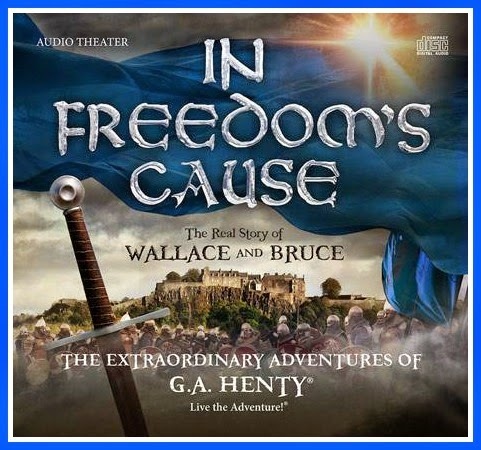 Henty tells us a story of Scotland's yearning and fight for freedom led by two notable men in history. In this story, Henty brings to us the life of William Wallace's, retelling about his life both on and off the battlefield. Young Ned's father is slain by a nobleman, and his mother has hidden this story from her son until now. Ned is determined to seek revenge on his father's murderer, and begins to train as a warrior. He is sent to be tutored by his uncle, and meets the wife of the already legendary William Wallace, who in turn introduces an awestruck Ned to her husband. Henty brings to life not only this hero-worship that many had for Wallace, but Wallace's humility. He doesn't wish for glory, he fights for freedom from a distant king interested only in what he can take from the Scots. Wallace shares what is most important to him - not his fabled Claymore, but his Psalter - which will give him courage to face the worst of his life. When Ned admits he has "misplaced" his own Psalter, Wallace challenges him: "Would you ever misplace your sword?" After Wallace's execution, the story continues with Robert the Bruce. He eventually takes up where Wallace left off, fighting for the cause of Scotland's freedom. Ned continues fighting alongside The Bruce, helping to ultimately overthrow the British rule. 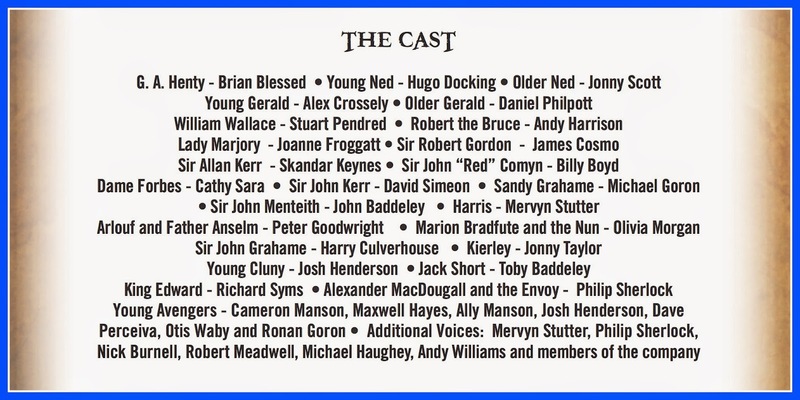 Once again, the producers have assembled an amazing cast. Brian Blessed returns as G.A. Henty, the narrator of our story. Ned and Gerald appear again as well, voiced by the same actors (. At first, Matthew and Celia didn't realize that this was the "next edition" from Heirloom Audio Productions. After a moment of listening, Celia said, "Hey! That's the names of the guys in the other...wait a minute!! I get it. It's the same narrator telling the same people a story! It's the same voices!" Yep, it is and they are! Once they realized this, they were ready for the story to begin already! 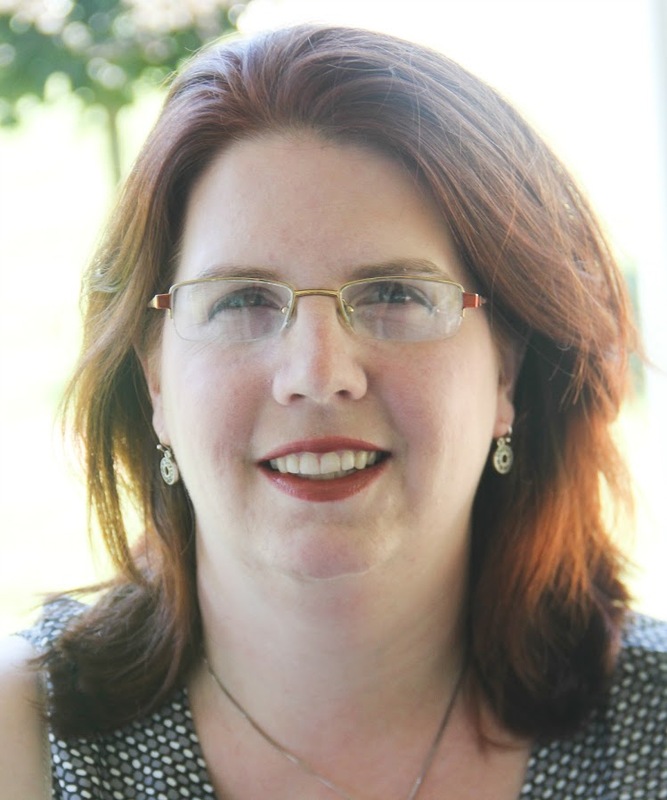 Another well-known actress joins the cast for this production; you may recognize Joanna Frogget from Downton Abbey as Lady Marjorie. Something I absolutely admire is how well the actors remain in character. Scottish dialect is hard. Each character had a distinct voice, showing just how well researched both the directors and actors are. You wouldn't lump a Texan character with a New Yorker and a Minnesotan and call it "American" - each would sound like his native region, and you'd ridicule any film that tried to do otherwise. In Freedom's Cause is no different, and here the different regional nuances are apparent. For most of the actors, a Scottish burr is not their normal dialect, but for all of them, their commitment to their character's voice never wavers. In fact, there were a few places we had to skip back because we missed something -- a voice was so Scottish we cuid nae ken what was being said! -Wallace's idea of vengeance being the wrong motivation for fighting. Ned is propelled forward by the idea of avenging his father's death. Wallace points out a bible passage from Deuteronomy: "Vengeance is mine, and no recompence." (Dt. 32:35). It is not for Ned to fight for his father, or even for Wallace to fight in revenge for his wife's murder (he realizes his wrong when he has time to reflect and not act in instinct). They discuss how their motive must be to free Scotland as nation, not seek to ruin English lords for their actions towards the Scots. 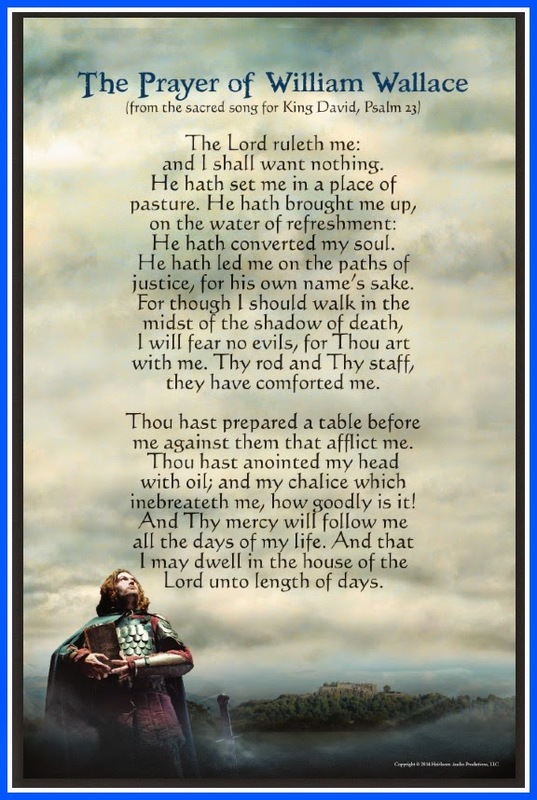 -An overarching theme is the words of Psalm 23. There is some confusion in the character's minds as to the meaning of the verses "Thy mercy shall follow me all the days of my life." (Ps. 23:6). How can there be a merciful God who allows Ned's father, William Wallace, and so many other men to be cut down in battle? Wallace dies a horrific death - the English want to prove their power - with his Psalter held in front of him by an attending priest. They characters come to realize man is not guaranteed a long life, or even a merciful death. The passage never means that. Rather, it's a reassurance that God is with us always, even in the dark times. -The third major theme we discussed was the ever-present "Double Bind." A double-bind is where you have two equally bad choices. For the Scots, the options were accept a position in the English hierarchy, give up the fight, and save their lives, or risk death in the hope that eventually they would all be free. Here is where Luke and I started to bring William Wallace's legacy into American history. How many left behind what they knew in the hopes of a better life in America, knowing they could be wrong; if they starved at home, at least they didn't starve alone. When the men of the Continental Congress signed the Declaration of Independence, they were at a crossroads -- continue as things were and be yoked to the British Crown, or risk "our Lives, our fortunes, and our sacred Honor" and fight to be free. Now knowing a bit more of the history of where these men came from, we could feel an even stronger chafing against the almost dictatorial British crown. However, In Freedom's Cause isn't all deep philosophy. We got some good laughs as the boys in the story tried to master a "goat woo." What? You've never heard of a goat woo? Well, let's just say that the Cullybackey Pipe Band is much better with it than our fearless Scottish Avengers. (And after hearing the zero-experience chantler player in action, this mom is suddenly thinking that Celia's new violin pieces don't sound quite so terrible!) The boys also got some battle strategies to try out in some of their video games. Both were particularly impressed with Wallace's tactic to allow half the advancing British army across a river bridge before attacking, rather than trying to keep them from crossing. Luke said he'd never have thought of that, but it made sense -- divide the group so it's fighting with half of it unable to reach the front of the line. Luke also explained why it was a good strategy to take out the leader, as Wallace's men did -- there was usually one good leader and the rest of the army simply followed command. If you take out the person giving orders, pandemonium usually follows because there's no one to give direction. The publisher's age recommendation for the program is "six to adult," but I would put it more in the "middle school and older" realm. With two plus hours of intense listening, plus the dialect, it was overwhelming for the younger boys. They enjoyed the stand-alone music of the soundtrack more. 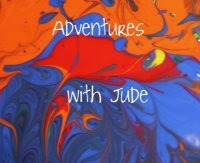 Celia noted that she was "really glad" it was not a movie -- it sounded like there was a lot of blood and gore involved! The study guides provide a strong base for using the CD set as a literary study, including content/comprehension questions and vocabulary, and we found it was a good starting point for a history and philosophy study. At the end of the story, "Henty" hints that he has more stories to tell. Heirloom Productions has shared with us that there will be two new stories released this year. One is going to be titled "With Lee in Virginia," and explores the American Civil War. We can't wait! While you wait for your copy to arrive, discover In Freedom's Cause through the other Crew Reviews.